Says it laughs at the 44 mag? No doubt only a matter of time before we see some revolvers for this too I reckon. Nice. Oooooh buddy, did you see the price on the rounds? Definitely have to reload those. Makes me feel better about the 10mm I’ve had a hankering for recently though. Always look at the good side. I can use that cost savings when explaining to the wife too. I am just glad there is finally ANY pistol round between 50AE and 10mm Auto... Not that various gun manufacturers haven’t worked around this with revolver rounds, like Magnum Research, Coonan, AMT and others. I can’t wait to see IF another company chambers for this round second in an auto. With some knowledge of how the 440 CorBon round went, I am glad this is happening now under better conditions. I wonder if a BFR is likely for this round, other than as a custom build. I will be ordering a barrel or barrels (6” & 10”) day one. Nothing on Magnum Research website yet though. This is a niche cartridge just because you can. I suppose you are correct... even with the popularity of the 50AE, it is barely mainstream... I edited some of the "fan-boy-ness" out of my post. I suppose it isn't the fact that 357 Mag and 44 Mag being revolver cartridges that deters gun makers from using them, because the companies that want to use rimmed cartridges, find a way that works reasonably. Even if niche cartridge, for myself, I am glad this is being done, and I will be buying the ammo for some time. And though I am not a re-loader quite yet, I keep all my big brass for when that time comes. When loading dies become available, I will get them for 429 also. Most likely, I will get a chamber reamer also if that becomes available. So for me, this is a great opportunity to enjoy another caliber with the Desert Eagle. Look forward to performance and chrono-data soon after I get them. I have ordered one... they have listed the 6" standard barrel in black. At least they aren't gouging us on the early run, like happens with some products. This is very true when you think about it... and this is why it is a perfect match for a niche pistol which also was made just because they could. Last edited by MrBlackCat; 11-17-2018 at 11:56 AM. Fantastic Blackcat, now to work out how to get one imported. Good to see the reasonable price offering. This isn’t a real/full review of the new .429DE Magnum caliber, so I won't make another thread. I will just put it here. This is just some day one observations and experiences. No penetration tests. No accuracy over distance tests etc. This is just about function and a small chronograph sample. 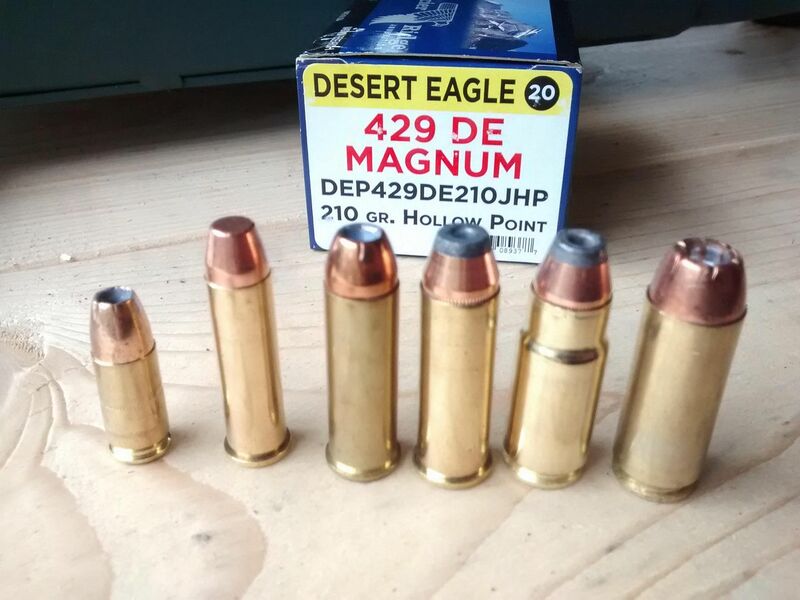 The 429 compared... left to right, 9mm, 357Mag, 41Mag, 44Mag, 429DE Mag, and 50AE. I got just a barrel in this case... not buying another gun, currently only offered in stainless with an internal muzzle brake, which effectively shortens the barrel. A shorter barrel is not what I want in a magnum handgun round. I want to give every opportunity for as much powder burn as possible. On a side note, there isn’t a 10” barrel planned in the 429DE, as all 10” barrels have been discontinued at this time. Sad. I will re-chamber a 10” 44mag barrel for the 429 as soon as chamber reamers become available though. If you are only interested in ballistic test stats, they are at the bottom. Just skip the next two sections down to “Ballistics”. Note that all below is based on an “out of the box” barrel. I will polish the ramp and chamber as I do on some of my barrels. Oddly, this is a two part barrel, which to my knowledge is only made this way in Israel. I’ve not seen a two part US made barrel before so I doubt this is made in the US. It also shares a gas cylinder perfectly in spec with my other Israeli made barrels, unlike any of my US made barrels. First... the 429DE round is stated to be magazine compatible with the 50AE. There aren’t any custom magazines planned I am told, but I might modify some 50AE magazines and designate them as 429DE. Here is why. This is a necked down cartridge from a 50AE case to hold a 429 bullet. 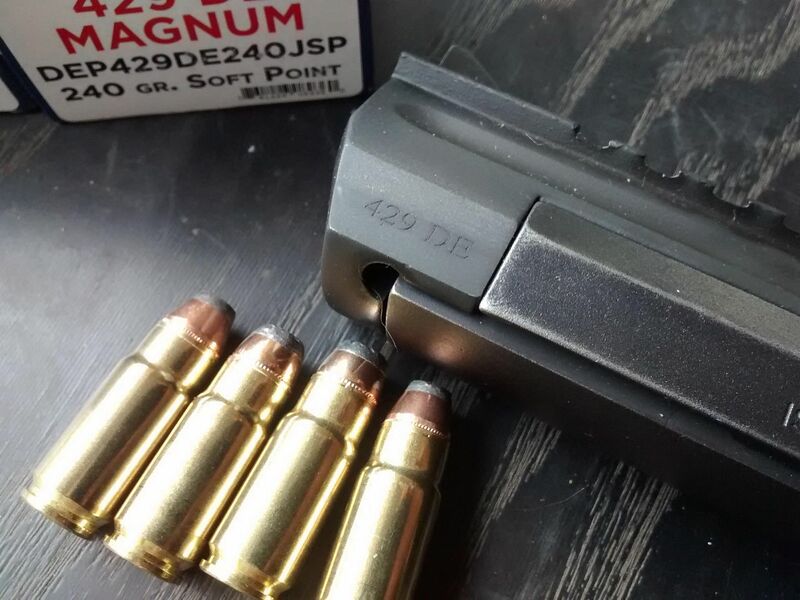 (.429 is a 44mag actual diameter, for those who don’t know) There is a slight tendency, when the magazine is full, to nose down just a tiny bit, keeping it from heading up the feed ramp. This only happened once, on a full magazine. No other feeding issues were experienced. Second… it is substantially more difficult to load the rounds into the magazine than 50AE. I use a loader with 50AE only when loading up 10+ magazines. But I broke out the loader after the first magazine in this case. Big deal? Not at all, just wanted to mention it, as it is different than anything I have experienced with a Desert Eagle. Try to avoid this scenario... if your gun is dirty from shooting a lot of cheap 50AE, target ammo... and you get exited because your new 429 barrel comes in... and you don’t even wipe the slide and springs, just so you can get some rounds across the chronograph... most of the cases MAY eject almost straight back over your head… or some of the time they will hit your glasses or head. Also, you might get some failures to return to battery... but just wiping off the slide and recoil springs and rods with two tiny sheets of Hoppes Lubricating Gun Oil Field Wipes, solves both of these issues, at least in my case. With that said, the 429 did not throw the best pattern of brass for sure. The 50AE, I can put a box to catch nearly all the brass when shooting from a rest. 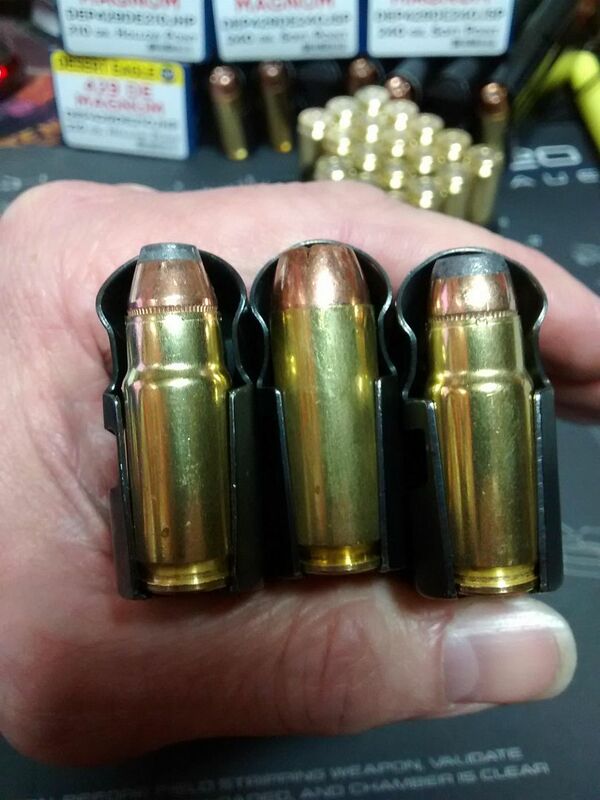 The 429 simply didn’t pile the brass as consistently... I expect this will change when I polish the chamber and inside of the locking lugs on this new barrel. It might be a break in issue, but I don’t wait for that with a Desert Eagle barrel. I don’t consider ejected brass pattern a problem, just something comparative that I noticed, and thought I would mention. Functionality was fine after I took 45 seconds to wipe the powder residue from the slide, frame, and recoil springs. 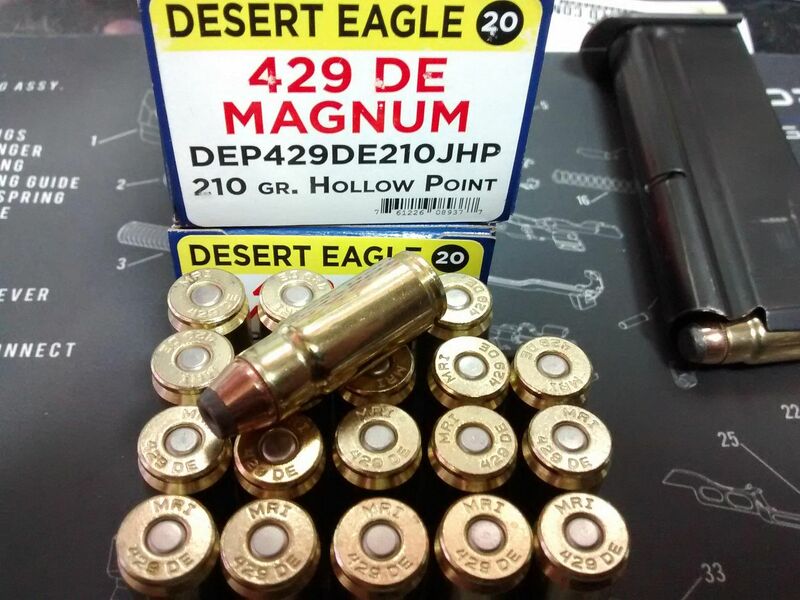 The 429DE is a rather “snappy” round for the Desert Eagle... I swear it has more “climb” than other calibers, but not sure how to quantify that. It felt like a 44 mag 10” barrel basically. It falls right in line between 44 and 50, as expected. I got some of the two loadings offered by Magnum Research under the name Glacier Ridge Ammunition – Magnum Research. One is a 210gr JHP, the other is a 240gr JSP. Using a Caldwell chronograph... 14 rounds each. Just as the math would have shown, it has the energy of a 50AE in the diameter of 44 mag. The penetration must be crazy. I don’t do anything fancy like gel testing, but I do test with wood, paper, and other materials for comparison sometimes. This will be an interesting round to explore.